A fad is defined as an often short-lived, enthusiastic craze for something. The skincare industry is no stranger to fads. As ingredients develop and access to materials becomes easier, faddy products are hitting the shelves frequently, cheaply, and often with little idea of the long-term implications for consumers. Here are some current fads on the skincare shelves and what regular use means for your long-term skin health. Why the hype? If we are to believe the claims, micellar water is the beauty product that no bathroom cabinet should be without. Micellar water is an all-round skincare wonder that consists of micelles (cleansing oil molecules) suspended in a water-based solution. The claims surrounding micellar water are that the dirt and impurities are drawn to the micelles. Because the liquid is water-based, regular use won’t dry out your skin. Micellar water can replace face wash, makeup remover and in some cases, even moisturiser. The truth: If you have micellar water in your cupboard, check the ingredients list. Your product will contain polyaminopropyl biguanide, or PHMB. PHMB is an ingredient commonly used as a preservative in skincare. It’s also used in cleaning solutions for contact lenses and in some deodorants. PHMB is banned for use in skincare products in some countries but is still legal in Australia. Countries that have prohibited PHMB in skincare have identified it may cause cancer, gene mutation, or impact the reproductive system. If, as we hope, PHMB makes the banned substance list here in Australia, micellar water would very quickly become a product of the past, leaving consumers wondering what on earth they were thinking putting it on their face. Why the hype? Charcoal masks are all the rage. You paint on a charcoal-based gel to your face, and while you relax for 10-15 minutes, the charcoal draws out impurities, toxins and bacteria from your skin. When you remove the charcoal, you also remove the impurities. The truth: Firstly, anyone who’s ever tried the masks will have felt the pain caused by physically ripping the dextrous material from your face. Irrespective of the damage this does to delicate skin cells, it’s worth understanding what binds the masks to your skin in the first place. If that name sounds familiar, it’s because it’s the liquid plastic found in hairspray and nail polish. That’s right, while your charcoal mask is drawing out toxins, it also contains harmful chemicals that are left to seep into the deeper layers of your skin. Charcoal masks also contain PVA glue, commonly found in arts and crafts sections in primary school. If you’re using charcoal masks designed for sensitive skin, be aware that the ingredients are known skin irritants and can cause more problems than they solve, including dermatitis. Why the hype? Silicones are found in many foundations, serums and primers. Silicones are an in inexpensive ingredient to add to products to fill in fine lines and make the skin soft and smooth. The truth: While silicones may leave your skin feeling smooth and supple on the outside, on the inside, they trap dirt, sweat, bacteria, sebum and dead skin cells in your pores causing congestion and potentially leading to acne. While you might benefit from having skin that’s smooth to touch, long-term use of silicones harms new cells that are forming deep within the dermal layer. As these skin cells reach the surface, they’ll be damaged, sensitive and will leave your skin in worse condition than before you started. Fad: Alpha Hydroxy Acids (AHAs). Why the hype? AHAs are the anti-aging solution that consumers have been waiting for. Not only do natural AHAs smooth wrinkles and clear blemishes, but they also hydrate the skin and reduce pigmentation. The Truth: AHAs are definitely a recommended part of a healthy skincare routine. The harm is caused by excessive overuse and aggressive treatments. AHAs are extremely powerful and should be used with particular care to avoid problems associated with overuse such as dry, flaky and sensitive skin. Why the hype? Gold masks are available in a sheet to cover the whole face or as under eye or above the lip pieces to directly treat problem areas. Gold is thought to contain anti-bacterial properties and will stimulate collagen production to reduce the appearance of fine lines and wrinkles. The truth: The gold nanoparticles contained in your facemask do absolutely nothing. Gold is a mineral which is neither water or oil soluble and can therefore NOT be absorbed by your skin. Any results from gold masks are due to harmful synthetics and chemical ingredients, not the gold itself. When everyone’s talking about the next miracle product, it can be hard to avoid the bandwagon and try it for yourself. When you choose Biologi, you don’t need fad solutions to add to your skincare. All our serums are 100% natural, 100% active, and 100% effective to treat a range of skin conditions. Using a revolutionary extraction process, Biologi serums are pure plant extract that work on your skin as they do in the plant. If you use natural products combined with a quality cleanser; facemasks, synthetic ingredients and harmful chemicals will become a thing of the past, and your results will be better than ever before. 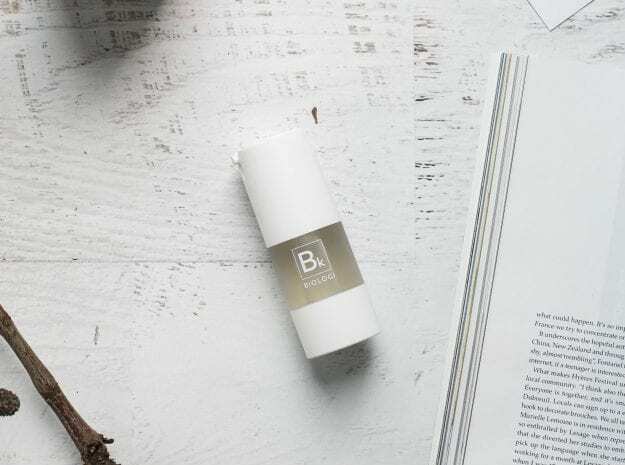 Your long-term skincare results are all in the Biologi, and Biologi is not a fad, it’s here to stay.